An Evanston carbon monoxide poisoning sent eight residents to the hospital Monday morning, according to Evanston Patch. Evanston fire crews responded to a call that a carbon monoxide detector was going off in a two-flat in the 1400 block of Pitner Avenue. The eight people that resided in the building were all taken to the hospital after reporting symptoms of carbon monoxide poisoning, which include headaches, dizziness, and nausea. The residents were taken to Presence Saint Francis Hospital and Evanston Hospital. Although the source of the leak was undetermined, the fire department found carbon monoxide levels of 200 parts per million. After two to three hours at this level, people will start to experience dizziness, nausea, fatigue, and headache. After eight hours of exposure at this level, people will be unlikely to survive. Each year, more than 400 Americans die from unintentional, non-fire related carbon monoxide poisoning, more than 20,000 visit the emergency room, and more than 4,000 are hospitalized, according to the CDC. The affected residents are in stable condition as of Monday afternoon, according to Evanston Patch. The cause is still undetermined, so the Evanston Fire Department and Nicor Gas, a natural gas distribution company, have joined forces to investigate. It is unclear how severe the poisoning was, which can be determined by taking the people’s carboxyhemoglobin levels. Carbon monoxide binds to hemoglobin with 200 times the affinity of oxygen. The theory is that carbon monoxide replaces oxygen. At the same time, toxins are building up. When the brain is deprived of oxygen, brain damage can occur, especially in parts deep in the brain, such as the hippocampus and the corpus callosum. This is because they are at the end of the oxygen route. A May 2008 study in the journal Brain Injury has also found that outcome of the poisoning is independent of severity of poisoning. The outcomes they measured included depression, anxiety, and cognitive sequelae (thinking problems). In almost all carbon monoxide poisonings, the failure to let the exhaust out of an enclosed space is the problem. It can happen accidentally with car exhaust; however, if it deals with the HVAC system, including hot water heaters or furnaces, there is nearly always greater than one party who is at fault or has negligence. This could fall on the installing contractor, the contractor responsible for maintenance, and/or the owner of the building. This illustrates why it is so important to have carbon monoxide detectors where the people are to notify them when there are dangerous levels of carbon monoxide. 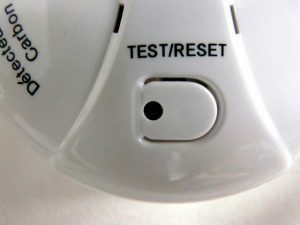 The law in Illinois requires a carbon monoxide detector be installed within 15 feet of each sleeping area in each dwelling unit.